This is why you should relish asking questions. 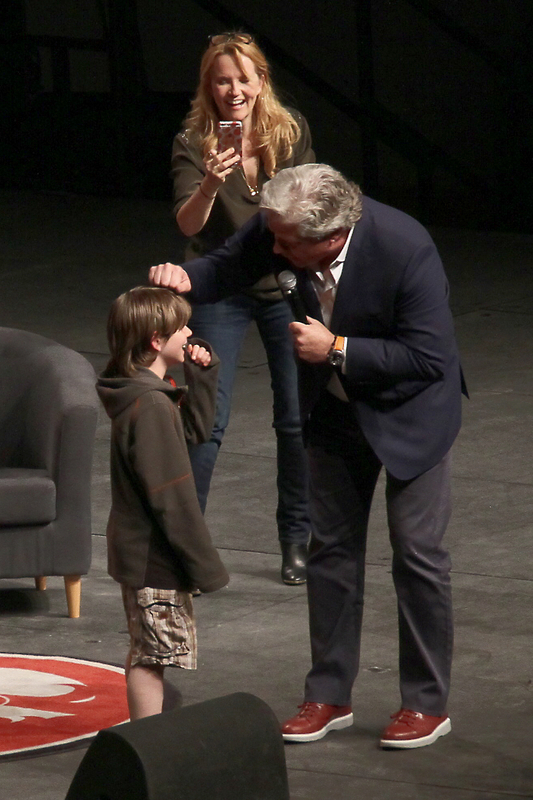 A boy named Sam, attending a Back to the Future reunion panel at Calgary Comic and Entertainment Expo Friday night, lined up to ask actor Tom Wilson what it was like to play Biff Tannen in the trilogy. If he really wanted to know, Wilson told Sam, he’d have to come onstage. “Get up here,” Wilson beckoned in a very Biff-esque way. Sam obliges … and once up there under the bright stage lights and the even-brighter gaze of thousands of spectators, Sam got to be on the receiving end of a scene in which Wilson repeatedly rapped him on the head while he asked, “Hello? Hello? Anybody home? Think McFly, think,” as he did to actors Michael J. Fox (Marty McFly) and Crispin Glover (George McFly) in the films. Actor Lea Thompson (Lorraine Baines-McFly), clearly delighted, captured the whole thing on her phone. It is an Expo experience Sam will surely not forget.